The human body is a beautiful, intricate system of moving parts. While it has the impressive ability to heal itself from almost any injury, sometimes it may need our assistance to return to its best, healthy function. For patients who are looking for a natural but effective way to improve the health of their skin or body, a PRP treatment will achieve cutting-edge restoration and rejuvenation. PRP, or platelet-rich-plasma, is comprised of platelets, a major component of blood clotting, as well as plasma, which itself is full of proteins known as “growth factors,” which encourage healthy healing. This concentration of growth factors is prepared from a sample of your own blood that has been processed for potency and safe use. In fact, the number of growth factors can be 5 to 10 times greater in PRP than they are in a standard sample of your blood! PRP Therapy is an effective way to nourish and jumpstart healthier healing and function in targeted areas of the body, without the use of incisions, foreign substances, or high temperatures. If you are interested in improving your body’s rate of healing or repairing your skin, we invite you to call Plastic Surgery Specialists today to schedule a complimentary consultation. Our blood can be considered the messenger of our immune system, delivering the information necessary for tissue regeneration and healing. Platelet-rich plasma is a concentration of your own blood that contains a high quantity of proteins, including keratinocyte and fibroblast growth factors, which communicate the need for cell growth. Your blood sample will be prepared with an activation agent in order to optimize the growth factors, as well as to help the PRP stay within the desired treatment area once injected. These growth factors can promote major healing and improved performance of our muscles, tendons, and other tissue, as well as achieve cosmetic improvements by promoting collagen production. The increase in vital collagen will tighten and heal the skin, effectively repairing scars and damaged capillaries, as well as filling in fine lines and wrinkles. The recovery after a procedure that incorporates PRP tends to be shorter, due to the fact that PRP improves both healing rates and overall outcomes. Minimally invasive to prepare and administer. Enables a comfortable procedure and overall easier recovery. PRP can improve the healthy, soft, youthful quality of patient’s skin. PRP, when incorporated into a skin rejuvenation treatment, will greatly improve the appearance and deep health of your skin. Praised for its anti-aging properties, PRP can be injected or applied as a step in almost any skin rejuvenation procedure. Some people, for example, incorporate it into their radiofrequency skin tightening treatment, or into a hyaluronic-rich facial. The most common form of PRP Therapy for skin rejuvenation is a microchanneling treatment that incorporates PRP, also known as a Vampire Facial. When you come to Plastic Surgery Specialists to receive your Microchanneling with PRP, we will draw a sample of your blood. The sample will be spun through a centrifuge to separate the healing components. Your protein-rich plasma, which will contain the cells and chemicals your body needs to heal, will be made into a potent serum. After applying a topical anesthetic, we will use a Livra Microchanneling device to create small channels in your skin with miniscule, easily controlled micro-needles. These will create pathways, or microchannels, in your skin. The microchanneling will both stimulate collagen production in your skin and allow newer, healthier skin to reach the surface. The channels will communicate to the skin that it needs to heal while leaving the surrounding tissues untouched. After your Livra Microchanneling is performed, the serum of your platelet-rich plasma will be applied to your skin. The healing serum is targeted to where it is most effective. The PRP will penetrate deeply into your skin, thanks to the pathways created by the microchanneling. In fact, this method has shown to increase serum absorption by up to 300%. Thanks to the growth factors within the PRP, patients’ skin will heal more quickly from its microchanneling, and scars and age spots will be less visible. PRP, when incorporated into a skin rejuvenation procedure, will promote collagen production in a patient’s dermis. This will, over the weeks following your microchanneling, add more volume to the skin, which in turn will fill in fine lines and wrinkles. The skin will be stronger and healthier than before, therefore improving skin texture and tightness. Due to the fact that it will take time for the new collagen to reach the surface of the skin, it can take a few months before patients experience their final results. If you are looking for a minimally-invasive way to restore a youthful glow and tighten your skin, call the Plastic Surgery Specialists to schedule your consultation for Microchanneling with PRP today. Patients who would like to improve volume and smooth wrinkles in a targeted area of their face have the option of receiving dermal fillers in addition to PRP. Dermal fillers are injectables such as Restylane, Juvederm, and Belotero. These are designed to add natural-looking volume to areas of the skin that have developed fine lines and wrinkles. 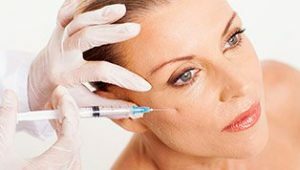 Dermal fillers effectively smooth these wrinkles away. With the added boost of PRP, your skin will both create new collagen and regenerate more quickly, which will compliment the contouring achieved with the fillers. As a result, skin looks more volumized and youthful. If you want tighter, healthier skin, PRP may be the perfect, minimally invasive boost your treatment needs. Ideal candidates for the benefits of PRP therapy are those who are non-smokers, not pregnant and do not have anemia or any other pre-existing condition which could interfere with your successful healing. Microchanneling with PRP Therapy is not recommended for patients who have sensitive skin, low pain thresholds, or active cold sores. Our goal at Plastic Surgery Specialists is to give each patient the highest quality care possible. We invite patients who would like to know more about their skin rejuvenation options with PRP to schedule a complimentary consultation with us. During your consultation, Dr. Poulos, Dr. Hvistendahl, or Dr. Restivo will go over your medical history with you, as well as go over your medication use, lifestyle habits, and goals for your appearance. If you are a good candidate for PRP therapy, your doctor will create a treatment plan that will achieve your best, desired results. PRP will improve both your rate of healing and the function of your skin and body overall. However, if your doctor believes you will achieve better results from an alternative treatment, they will discuss this option with you. Your doctor will give you individualized instructions about how to prepare for PRP therapy. You may be advised to quit smoking for at least three weeks, as well as to discontinue certain medications before your treatment can take place. If you have any questions regarding your treatment with platelet-rich plasma, please do not hesitate to call our office. The first step of your PRP treatment will be a blood draw. Your blood will be safely processed through a two-step centrifuge, which will separate your plasma and platelets from your red and white blood cells. The PRP serum used in your treatment will be a potent source of valuable growth factors. If you are receiving PRP as part of a skin rejuvenation procedure, the platelet-rich plasma will be administered to both boost the effects of your treatment and to stimulate new tissue and collagen growth in its own right. For example, Livra Microchanneling creates pathways for your dermis to renew itself with increased collagen production and skin healing. When applied, the growth factors present in the PRP will promote an impressive recovery in your skin function and improve the scale of your collagen production. Skin will become fuller, wrinkles will become tighter, and your topical skin will regenerate into a smoother, more even appearance. Patients who are interested in the regenerative benefits of PRP can have PRP injected to help relieve their back pain, disc pain, and arthritis. The injection will encourage stem cell proliferation, due to the growth factors in the PRP. This will enable your body to generate new, healthier tissue and to heal effectively. While the results of your PRP therapy will depend on your body’s unique response to the PRP, as well as the particular treatment you have selected, patients repeatedly express surprise at the quality of their healing and health after incorporating PRP into their treatment. Patients who receive PRP as part of a vampire facial are able to share their results within two days of their treatment and will continue to see their skin quality improve as their renewed collagen production works the fuller, smoother skin to the surface. Results of a skin rejuvenation procedure with PRP can last for six months or as long as two years. Some patients may decide to receive 2 or 3 injections over a few months’ time to achieve their best results. The price of your PRP treatment will depend on the details of the particular procedure that you and your doctor agree upon. Once you complete your consultation with Dr. Poulos, Dr. Hvistendahl, or Dr. Restivo you will receive a cost breakdown that reflects the details of your individualized treatment plan. If you have questions about what PRP can do to revolutionize the function of your skin and body, we invite you to call Plastic Surgery Specialists today.